Ah! 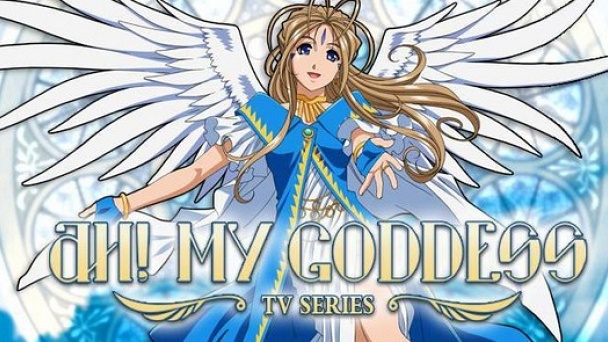 My Goddess :: Show Information :: RabbitTV GO! Keiichi was looking forward to university life. But in reality, he had no luck in clubs, love, and life in general. The truth is that he had an unlucky star above his head. One day, Keiichi was stuck watching the dorm while his senpai left, and they had left him a mountain of chores to do, too. Keiichi was a good-natured person, and set about doing his duties. His final chore was to make a phone call. The responce he got from his misdialed number was, "Goddess Assistance Agency." Out of nowhere appears Belldandy, a Goddess with her own business card, and offers him one wish to change his life. ONE wish. Thinking it all a joke, his wish goes "I want a Goddess like you to stay with me forever." His wish granted begins his new life.